The two most common methods used to trigger a thermal shutoff, eliciting a failure position in pneumatically operated Emergency Shut Down and Emergency Isolation Valves are: (1) Fusible Plugs, and (2) Plastic Tubing. Both of these techniques have been used in emergency shutdown systems for years in refining, chemical, petrochemical, pulp and paper, flavors and fragrances, semi-conductor and pharmaceutical processes. A third technology based on memory shape alloys used successfully in space and aviation is increasingly replacing fusible plugs and plastic tubing based thermal shutdown systems. When the fusible plug is triggered, the air supply is not stopped. Air continues to flow through the actuator cylinder and out the open pipe plug. This air supply increases oxygen available to fire, potentially adding to the intensity of a fire. When the valve assembly requires periodic testing, the Fusible Plug must be replaced with a new Plug after each test. The flow of the air supply is not stopped and continues to flow through the ruptured plastic tubing. This air supply (increased oxygen availability) can aid in the intensity and propagation of a conflagration. If the valve assembly is required to be tested periodically, some arrangement would have to be established to simulate the rupture or actually heat and replace the plastic tubing. Plastic tubing is unreliable. The effects of ultraviolet rays, age, heat, and ambient conditions can cause the tubing to fail unexpectedly, causing expensive plant shutdowns. The flow of the air supply is shut off and the actuator is vented allowing the actuator to move to, or remain in, its fail-safe position. Because the air supply is cut off, oxygen is prevented from continuously feeding a fire. With FireChek’s memory shape alloy the automated valve assembly can be easily and economically tested. Heat testing does not destroy the shutoff trigger. The shape memory alloy simply changes shape upon exposure to a specific heat level and upon cooling returns back to its initial shape. FireCheks can be heated with a conventional commercial heat gun to trigger it to shut off and then, after it has cooled, it can be reset by hand. No tools are required to reset the thermal trigger element. The FireChek has a compact and robust stainless steel body capable of reliable service in the most austere environments. The FireChek is FM APPROVED which may help save on insurance for the facility. FireChek ESD assemblies minimize loss risk in pneumatically controlled process applications for liquids and gases. U.S. refineries are discovering FireCheks on ESD (Emergency Shut Down) valves. In the following photo, the refinery is using the FireChek on their ESD valves on fuel gas lines to their burners. When configured with a fire safe ball valve, the FireChek thermal shutoffs function as EIV [Emergency Isolation Valves], as they fall in the class of API RP 553 Type D valves1. The fire safe valves are full port, metal seated, flanged ball valves operated by heavy-duty scotch yoke spring return pneumatic actuators. Refineries who have installed FireChek equipped ESD and EIV assemblies sought a solution to issues they had previously encountered with unreliable plastic tubing, which caused too frequent unnecessary plant shutdowns. The accompanying photo of the FireChek installation demonstrates the simplicity of the system design. For applications with high Cv requirements, Assured Automation is introducing a memory shape alloy based shutoff to meet the requirements of large actuators used in refineries. In addition, a field retrofit kit will be available for converting existing pneumatic actuators in the field. 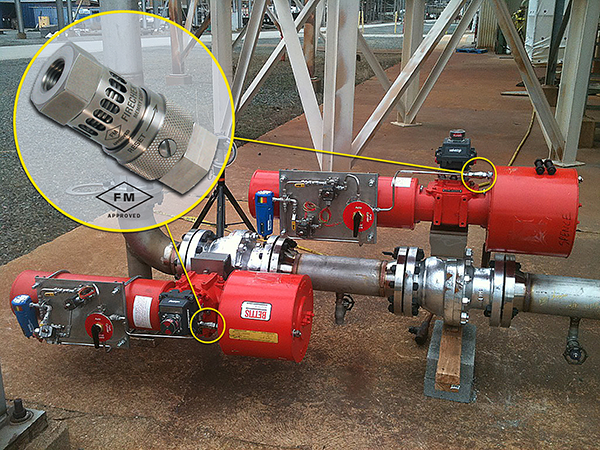 While the depicted ESD/EIV valves above are in use in a refinery within a hazard zone, valves equipped with FireCheks are used effectively in other industries, both within or outside of hazard zones. FireChek thermal shutoffs are frequently used on ESD valves complying with API RP 533 Types A, B & C or similar applications and standards in other industries. They can be used on practically any pneumatically operated valve, valves with spring and diaphragm actuators, double piston rack and pinion actuators and scotch yoke actuators either double acting or spring return, either on/off or throttling. The process valves can be metal seated, fire tested or standard soft seated valves. They add safety to a wide and diverse number of process applications. FireCheks improve the reliability of triggering pneumatically operated ESD’s and EIV’s. This entry was posted in Biofuel Industry, Emergency and Fire Safety Valves and Devices, Flavor/Fragrance, Food/Beverage, Latest News, Pharmaceutical, Plastics and tagged Automatic Gas Shutoffs, Fire Safety, Thermal Activated Gas Shutoffs. Bookmark the permalink.